A great price 125 us dollars for a great hotel and very good restaurant. 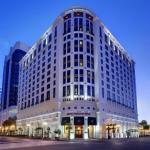 Very hip hotel located in the heart of downtown Orlando. Walking distance to several bars and restaurants. Would definitely recommend this hotel for business travelers and vacationing couples, but definitely not for families. Very adult hotel in great location. Parking was a bit expensive. This hotel is very beautiful and spacious. The well appointed lobbies and guests spaces exceeded my expectations. The pool area was also phenomenal housing a large tent and chandeliers to light the night sky over downtown Orlando. Everything was exceptional. We will stay again! The Grand Bohemian Hotel Orlando with AAA 4-Diamond rating is an award winning luxury property known for its music, rare artwork, superior hospitality and barrel-vaulted ceilings decorated with Italian mosaic tiles. Daily newspaper is complimentary. The hotel serves free evening hors doeuvres and continental breakfast to its guests staying at the Concierge Level. Wireless internet can be accessed from the meeting space, lounge, lobby and accommodations. Valet parking, fitness facility and business center remain open round the clock. There is a spa for beauty treatments and unwinding. In-room dining service is available 24 hours for the convenience of guests. You can choose from guestrooms and suites. Highlights of in-room comforts and luxuries include rich velvet drapes, Java wood, all-white pillow-top beds, roomy bathrooms with telephones, refreshment centers and 27-inch televisions with movies-on-demand. In leisure, you can browse through extensive art collection in the Grand Bohemian Gallery. Melt your cares away in Poseidon Spa that offers various signature body treatments. Laze around the heated outdoor swimming pool lending itself to the views of the city. Savor freshly cooked seafood, desserts and prime steaks in the Boheme Restaurant. The hotel offers space for wedding, meetings and other events and related services. The event space can accommodate up to 700 guests. This hotel is a perfect choice for a luxurious holiday. Almost all guests were pleased with good-sized elegant rooms, artsy décor, comfortable beds, Jacuzzi tubs, showers, spacious fluffy couches, the bar, yummy food at the restaurant, the spa treatments, artwork and personalized service. The hotel offered very good value for the money spent. However, a few visitors griped about poor housekeeping and restaurant services.